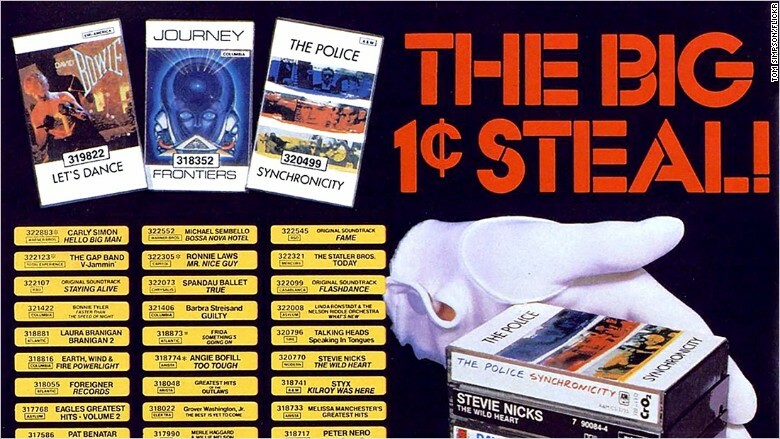 Columbia House was well known for offering piles of records, tapes or DC's for just one penny...to start. Before there was Netflix and iTunes, Columbia House ruled subscription-based media services. But its modern competitors have drained its profits. Filmed Entertainment Inc., which owns Columbia House, filed for bankruptcy in a Manhattan court Monday. Documents filed by the company say it will auction itself off. Its debt could be as high as $10 million, and it owes its 20 biggest creditors more than $6 million. Columbia House was widely used in the 1980s and 1990s offering monthly deliveries of records, tapes, CDs and later DVDs each month. It was famous for ads promising "Any 11 tapes or records - $1" or "12 CDs for 1 cent." In 1996, the company says it was was bringing in peak revenues of about $1.4 billion. How does a company make money giving away 12 CDs for a penny? After customers mailed in the first payment, they kept receiving shipments -- and bills -- each month until they opted out. Columbia House eventually switched to just selling DVDs, but things still went downhill. "The business has been in decline for approximately two decades," the company said in a press release. Last year, it had sales of just $17 million. The Columbia House bankruptcy filing says companies like Netlfix (NFLX), Amazon (AMZN), Spotify and Apple (AAPL) crowded it out of the market. It tried to offer streaming services for videos and movies last year, the documents say, but the company struggled to land licensing agreements that could compete with more established competitors. The company has been working with a financial services firm to find purchasers and investors since last year, and 20 have "expressed interest." Columbia House says it will continue to operate during the bankruptcy proceedings.